It was that time of year again, taking part in one of the best festivals ever!!! It found me driving up to Gateshead one day and Sunderland the next. On the 14th of November I met the children of Falla Park Primary School in Felling, I also met Denise the librarian who helped me all day. I had a really great time at this friendly and welcoming school. I performed my poems and answered many Very Hard Questions. It was a great morning, so enjoyable. 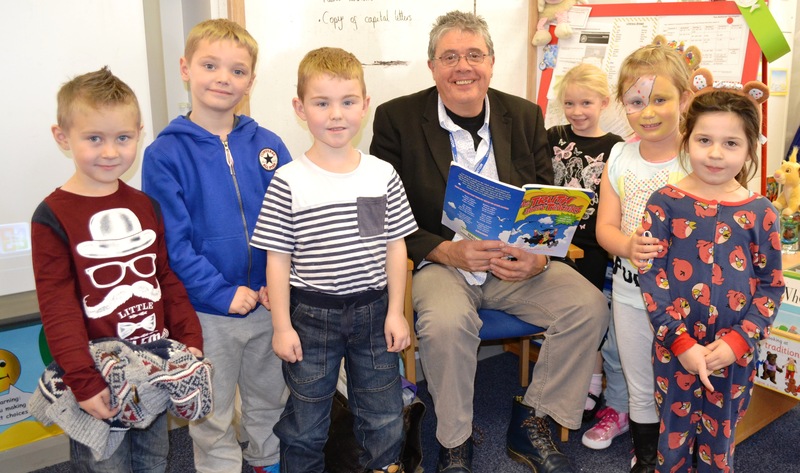 In the afternoon, I visited St.Alban’s Primary School in Pelaw for more good times and poems and laughs and joining in and being pirates. The next day I drove to Sunderland and met Stephen the librarian and his colleague Sandy at Grange Town Primary School. Here are some pictures of me and some of the fabbo kids who go to school there. Yes I know! More pirates! But this school is very near the sea so it’s only to be expected. I would like to thank the Headteacher of this marvellous school, Mr. McAnaney for taking these photos and allowing me to use them here. Then we visited Unsworth Grange Primary School who provided us with one of the best school meals EVER (fish cakes, chips and custard on the pudding!!! What more do you need????) I performed my poems and answered hard questions and had a really splendid time. Very enjoyable. yet again, I found myself in such a welcoming and friendly school. Both days were great and my thanks to the librarians and teachers and grown-ups at all the schools, my BIG thanks to the children I met and laughed with ……………. and a HUGE THANK YOU to the NCBF which every year provides schools and libraries with loads of poets and authors and illustrators ..it really is a Festival to be proud of, and I am always really really pleased to be part of it. Thanks, hope to see you next year.